From 1885, the year in which Thomas Edison invented the first phonograph, the phonographic cylinder was the only way of recording sound. In 1886-1901 the first engraved discs comercialised by Emile Berliner appeared, first in vertical grooves like phonographic cylinders, then in lateral grooves. Prior the appearance of magnetic tapes, radio broadcasting was recorded live on discs. With time the reading of certain of those original documents has become difficult or even impossible. We know that some discs and cylinders are broken, that the resin in which the groove was engraved is sometimes dislocated, that the groove itself is often damaged by the styli of the heads of that age. These had nothing in common with the highly sophisticated ones which read today's microgrooves. The research carried out at the EPFL has therefore first consisted in determining in which part of the groove the information inscribed by the stylus had best resisted deterioration. We had then to find a way of collecting this information in order to retrieve the recorded sound with the best possible accuracy. After having evaluated the various optical processes, a new process has been developed. It uses the optical fibre technology, thus allowing to copy documents of great value worthy of being preserved. The phonograph disc is composed of a spiral groove obtained by casting or by direct cutting, in which a sound signal is recorded in the shape of a lateral or vertical modulation, or both if stereophonic. The profile of the groove is a V open at 90 degrees. Each system of reading by optical means makes use of one or more of the three regions of the disc containing the audio information.These three regions are the land-groove interface, the groove walls and the groove bottom. The audio signal can be determined by measurement of the path of the interface groove-field. Unfortunately this interface is often damaged by scratches and bumps, which can give rise to unreliable information. The audio signal can also be determined from the vertical and horizontal path on the bottom of the groove. This part, however, is not very well defined because each pressing has a different shape and the bottom of the groove often contains dirt. The only source of reliable information is on the slope of the groove, which is not easy to sound optically. 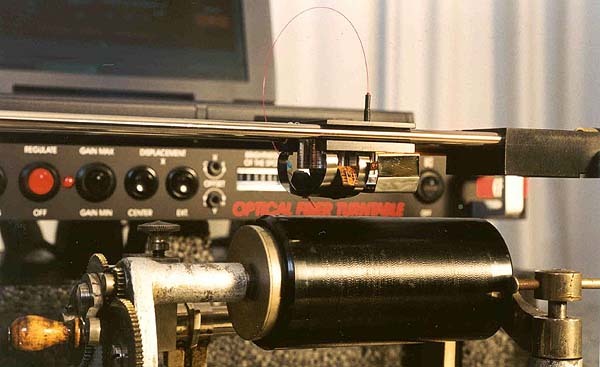 All the optical systems using the regions of the disc stated here come across problems such as: the state of the surface of the disc; the reflexion coefficient of the used part of the disc; the variation of the distance between the grooves allowing simultaneous reading of several grooves. etc... The fact that such a player is not available on the market, in spite of the efforts of several Laboratories and Companies, proves the difficulty of the problem. An optical fibre follows the groove of the disc. Its tip undergoes a horizontal displacement due to the modulation of the groove and a vertical displacement resulting from the faults of the smoothness of the disc. Movements of the optical fibre in the groove. Photo of the tip of the optical fibre. The geometry of the tip of the optical fibre as shown causes the fibre-air interface to reflect all the light injected into the fiber by the semiconductor laser. Thus the refracted waves which shine on the groove and may increase the background noise are eliminated. The reflected light is transmitted by a lens to an X-Y position detector. On the detector the displacement of the luminous spot along the X axis corresonds to the horizontal displacement of the fibre and along the Y axis to its vertical displacement. The X-Y position detector gives two currents per axis. When the spot is at the centre these two currents are equal but of opposite signs. The signal processing carried out according to the block diagram, allows to obtain one signal corresponding to the position of the spot along the axis x and one signal along the y axis. The two signals Ux and Uy are independant of the brightness of the spot. The X signal corresponds to the sound signal. 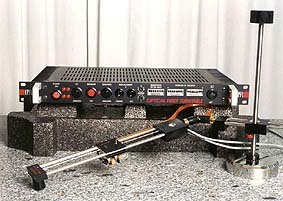 It is also used for the control of the horizontal displacement of the optical head. The Y signal is used for the control of the vertical position of the optical head. For records with a vertical engraving, (phonographic cylinders for example), the Y signals would correspond to the sound. It is possible to use the same system for the playing of stereophonic records by positioning the axis of the X-Y position detector. Noise measurements have been carried out with a reference record of type STR 110 (CBA Lab). The results for the optical fibre system in comparison to a classical system show that for a modern record in condition as new, the background noise is of the same order of magnitude and that the signal to noise ratio is slightly better for the optical fibre system. 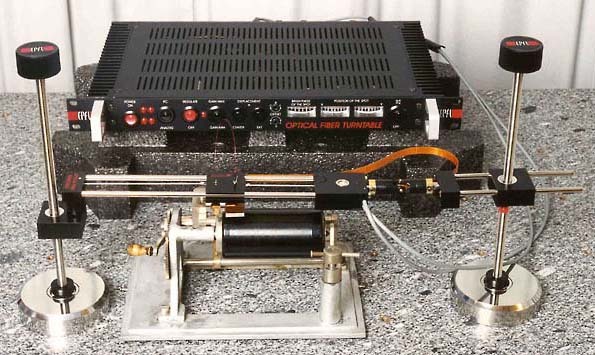 The most interesting feature of the optical system consists in its ability to play ancient and damaged records, as may be found in the sound archives of National Institutes and broadcasting stations. Due to the selection of the part of the groove used for reading the sound, the system plays the used records as if they were new. Indeed the optical fiber is in contact with the groove in a place where generally no stylus has ever passed. The force applied by the fiber on the record is limited to 60 mg, about 40 times less than that of a modern pick-up. Such a low force is possible because the guiding of the optical head along the groove is obtained by servo motors controlled by optical signals. The system allows the crossing of cracks and small zones without grooves, as frequently observed in ancient records made of a sheet of resin plated on a metallic surface. The spurious audio signals (cracks, etc...) due to this type of faults can then be easily removed using common digital techniques. This archive was recorded directly live onto a wax disc supported by an aluminium plate. Today, the wax has shrunk and shows lots of cracks (see picture below), thus this record cannot be read by conventional turntables without being destroyed. But thanks to the optical turntable, this interview with the Geneva gas company manager has been retrieved. 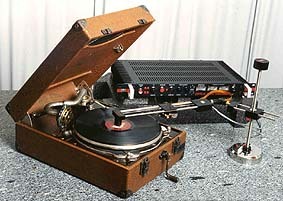 The optical turntable can of course be connected to a computer enabling the record to be digitally restored. It has also been designed to retrieve archives from cylinders, or directly from old turntables. 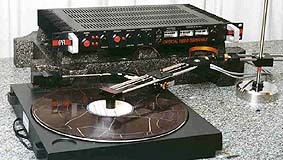 A turntable based on an entirely new principle (patented) allowing to read old records, discs and cylinders in good or bad condition has been built, and tested on various discs. The playing of archive records not playable by classical means because of their bad state of preservation has been successfully demonstrated on various specimens put at our disposal by the Radio TV Suisse Romande, Lausanne. The results with modern discs in good condition 33, 45 or 78 rpm are equivalent to those of a normal pick-up. The whole Poliak player, complete with the pick-up on its arm and the control unit. The player can be used with any gramophone or phonograph, here with an old portable gramophone. Close-up of the Poliak player used on an old phonograph. Note how the laser light is produced in the pick-up unit, takes a long turn through the optical fibre and then comes out the tip of the very fine fibre under the pickup.